Lincoln Water District workers drain a broken water main on West Broadway in Lincoln, Feb. 4, 2016. The Lincoln Water District on Monday issued a boil water order for residents north of Libby Street while a water main is repaired on Route 2. 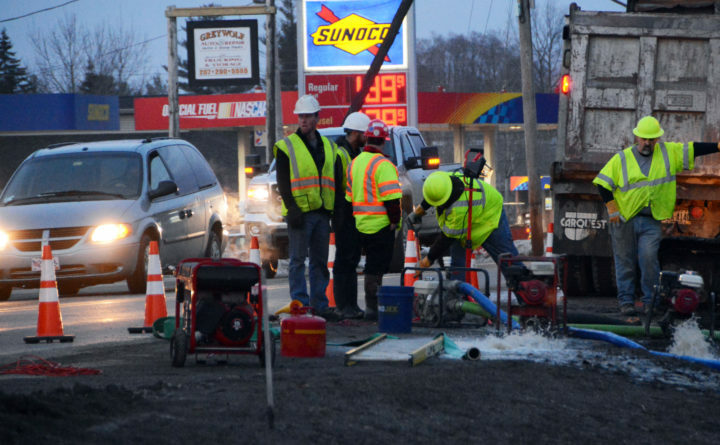 Some Lincoln residents will need to boil water before use while workers repair a water main on Route 2. The Lincoln Water District issued the order Monday morning and is in effect until further notice. The water district is repairing a main break on Route 2, and the water system will be depressurized during the repairs. The boil water order affects those residents north of Libby Street, according to the water district. Anyone with questions can call the Lincoln Water District at 794-2921.